I was about 17 years old when I became a carpenter’s helper to my brother-in-law. I used to help him build houses. I liked it because I was able to create something. Creating is something I’ve always done. I made about $95 a week, take-home. Even though it was above minimum, it didn’t seem like a whole lot. What I learned from that job was the value of quality work. I learned how to do things right the first time. I also learned about hard work. When I saw the demand for ironwork after arriving in Corpus Christi, I finally got the ball rolling on my own business. That was over 30 years ago. By the 1990s, our business demand grew too large for our small space. We could not organize our machines and production flow to keep up with demand, so we upgraded our shop. We bought the property next door and that's where we've been since. This larger property allowed us to set up the place the way we needed it. It also helped us keep our prices reasonable. In the time since, we have become the go-to solution for decorative iron. My greatest source of pride is that this is a family business. My son, Danny, literally grew up in the custom iron business. 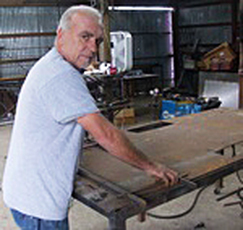 Today, he manages the shop and oversees operations for the company. Our family is proud to have been providing security, beauty, and value to the community for over 30 years. We look forward to working with your family or business to create your personalized ornamental iron security solution.